I’d always promised to write about less-appreciated realms of alcoholic exploration in these pages but find myself having less opportunity than I’d thought, especially given the facts that a) my time is limited, b) I’m keen to avoid becoming primarily a reviews site and c) so much has been happening in my key area of interest, i.e. beer. However, once again the rejuvenated Adnams has come to my rescue by coming up with something entirely unexpected. Well by me at any rate. If its recent adventures in mainstream spirits (gin and vodka) and beer-derived ones (Spirit of Broadside and its still slumbering whisky) weren’t enough the East Anglian drinks maker and importer’s Copper House Distillery has now extended its interests to that scourge of the pre-World War One Belle Époque Paris, absinthe. Or, more accurately, absinthes. One the traditional olive green Absinthe Verte (aficionados like to describe the colour as “peridot”), the other the hibiscus red Absinthe Rouge, both 66% ABV. Being a traditionalist I opted to buy a bottle of the Verte. Absinthe is perhaps the most notorious of alcoholic drinks, even more so than the rough and ready gin that so blighted Hogarth’s London, so its rehabilitation has been fascinating to observe. The muse and inspiration of many Art Nouveau artists, absinthe’s reputation as a cause of madness due, it was long thought, to the use of the supposedly hallucinogenic herb grand wormwood (Artemisia absinthium, from which it gets its name) alongside other “botanicals”, the most pronounced of which is green anise. However, its negative effects are now thought more likely to be attributable to a combination of adulterants in badly made absinthe allied to its high alcoholic strength. Very little of the active chemical in wormwood, thujone, actually makes it through the distillation process. That a company such as Adnams has entered the absinthe market shows how far the much vilified spirit has come since its “rediscovery” in the form of the massively strong but gimmicky Hill’s Absinth (with no “e”) in the late 1990s. Playing up the spirit’s Bohemian connotations, Hill’s began finding its way to the UK from the Czech Republic care of entrepreneur George Rowley who’d realised that absinthe had never actually been banned in Britain. Nor, for that matter, had it been banned in many nations beyond its French and Swiss heartlands (where it was banned in 1914 and 1910 respectively), presumably because it wasn’t widely consumed elsewhere. A friend and I acquired a bottle of Hill’s at least as much as a statement of our own (imagined) alternative credentials as from any genuine interest in the spirit. But the foul-tasting turquoise fluid and disaster-prone fiery sugar-cube ritual used to market it meant it soon found its way to the back of a cupboard and has stayed there to this day with little chance of it re-emerging. Assuming I even knew where it was. However, the ersatz fakery of Hill’s nonetheless revived interest in real absinthe and led to the creation of more accurate interpretations of the spirit with production notably restarting in its former strongholds of France and Switzerland (near-absinthe continued to be made in Spain, throughout) although it couldn’t be sold in either country for quite a few years subsequently. Nowadays there are many more. One of these early revivalists, American Ted Breaux, has remained at the vanguard of absinthe’s rebirth with his Jade Liqueurs range of meticulously researched, authentically produced recreations of classic absinthes from the heyday of the drink, which Breaux distils at the Combier liqueur distillery in western France. Adnams entry into the world of the green fairy gave me reason to get out my bottle of Jade’s Absinthe Edouard (72% ABV), the only other “proper” absinthe I’ve tried (they’re typically quite expensive) and considered one of the best by connoisseurs – and a good benchmark against which to evaluate Adnams’ first effort – for comparison. So first to re-familiarise myself with the Absinthe Edouard. Despite a couple of years since my last sampling the drink poured the same olive green I remembered. But I wasn’t going to sample it neat it or set fire to it. 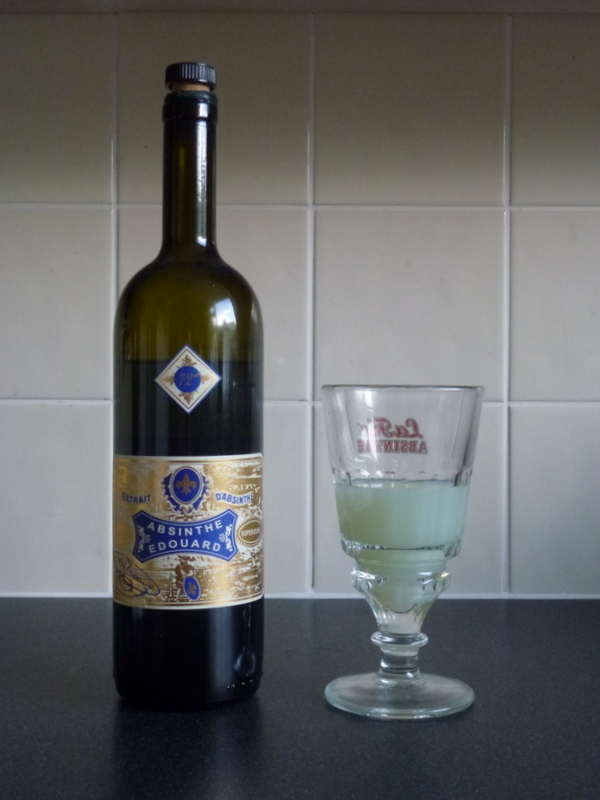 Unlike Hill’s fire ritual, real absinthe is actually diluted using iced water causing it to turn milky, or “louche”, as do its anise-accented descendants, pastis, ouzo, sambuca and other similar drinks (these are described as liqueurs as they are bottled with sugar, absinthe is not and is considered a spirit). The ideal is to drip the iced water from a tall (and rather gothic looking) absinthe fountain onto a sugar cube itself resting on a slatted absinthe spoon. The sugary water then drips into the absinthe turning it progressively milky until the louche reaches the meniscus at the top of the fluid in the glass. This should achieve the correct level of dilution. However, as I don’t have an absinthe fountain I resorted to a jug of iced water. This also gave me the opportunity to try both absinthes with and without sugar. Diluted, Absinthe Edouard threw an deep milky green louche. Without sugar it was nonetheless initially sweet from a blend of botanicals including star anise and fennel (the exact recipe is closely guarded), with the wormwood providing a bitter, woody background flavour on top of a slightly creamy palate. The aroma was a complex mix of all elements. After a few sips the drink began to dry in the mouth leading me to stir in a little sugar. This added to the creaminess and also brought out more of the anise and sweeter botanicals, the bitter wormwood fading into the background but still tantalisingly there. I’d forgotten how much I’d enjoyed this previously. Very worth trying and a stiff test for Adnams upstart. Adnams Absinthe Verte immediately stands out through the very obvious presence of lemon balm on the aroma, something its marketing draws attention to. Diluted, the Verte was actually more cream than green in colour and the louche was perhaps a little less “thick” than its rival. It was also less sweet than the Edouard without sugar, the lemon balm maybe a tad too dominant both on the aroma and the flavour in comparison. Nonetheless, this is unmistakably an absinthe, the anise and wormwood flavours coming through well once the lemon balm subsided and more so when sugar was added. It’s not clear to me whether Adnams has followed the route of the purist revivalists such as Ted Breaux by producing its absinthes using grape spirit distilled (possibly) in alembic stills (unlikely) as a base for its absinthes. But that’s not to dismiss the effort that’s gone in here. 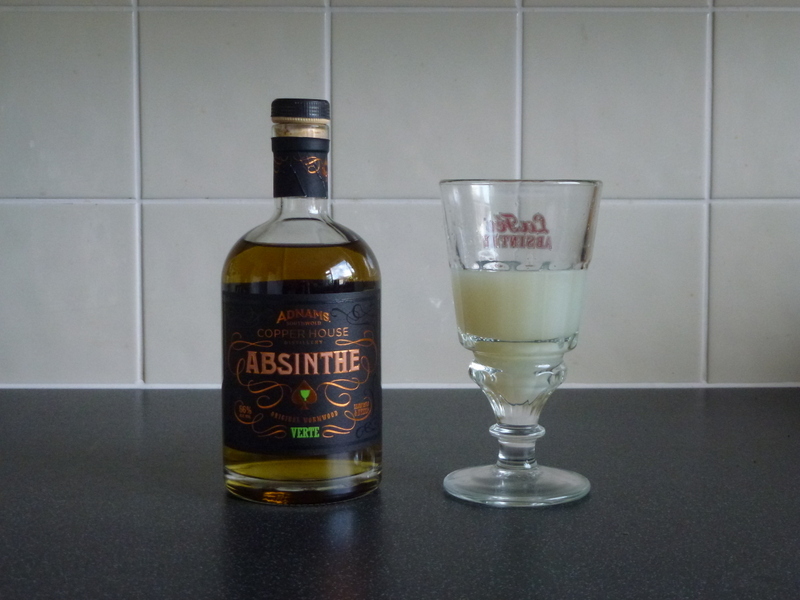 Certainly Absinthe Verte is a very decent new entry into this interesting category and further evidence of Adnams’ forward thinking and adventurous spirit.